ScalaFX 8.0.40 added support for Alerts and Dialogs. Dialog API allows for opening a dialog window and returning input from the user. The result can be as simple as type of button used to close the dialog. A custom dialog allows for returning an arbitrary result. There are several predefined dialogs called alerts that can be easily presented to the user. headerText = "Look, an Information Dialog." contentText = "I have a great message for you!" initOwner() specifies the owner for a dialog. Its use is not required, but it is a good style. Setting owner for a dialog allows the dialog to use the same icon as the owner and, for modal dialogs, block the parent when dialog is shown. Here are some more ScalaFX examples of Alerts based on ones presented in JavaFX Dialogs blog post. headerText = "Look, an Warning Dialog." contentText = "Careful with the next step!" headerText = "Look, an Error Dialog." contentText = "Ooops, there was an error!" Alerts and dialogs can be used to query user for information. Every alert returns type of button that was pressed to close the dialog. A simplest form of a query is a confirmation dialog that indicates whether user pressed OK or Cancel buttons. Strictly speaking a dialog returns an Option containing type of button pressed or None. headerText = "Look, a Confirmation Dialog." contentText = "Are you ok with this?" A dialog can return any content; an example will be shown later. First, let see how to use custom buttons in an alert. title = "Confirmation Dialog with Custom Actions"
headerText = "Look, a Confirmation Dialog with Custom Actions." contentText = "Choose your option." // We could also just add to existing button using `++=`. headerText = "Look, an Exception Dialog." contentText = "Could not find file blabla.txt!" // Set expandable Exception into the dialog pane. title = "Text Input Dialog"
headerText = "Look, a Text Input Dialog." contentText = "Please enter your name:"
A ChoiceDialog is used for selecting from a list of available choices. The list can be collection of arbitrary objects. The choice dialog returns Option selected by the user. headerText = "Look, a Choice Dialog." 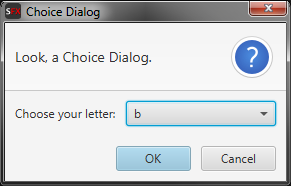 contentText = "Choose your letter:"
Custom dialogs can be easily created using Dialog class. Below is an example that shows a login dialog. Class Result defines result returned by the dialog. 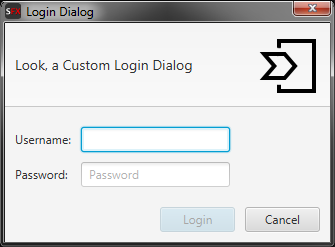 The dialog contains a custom graphic, two input fields (“Username” and “Password”), and custom buttons (“Login” and “Cancel”). // Create the custom dialog. headerText = "Look, a Custom Login Dialog"
// Set the button types. // Create the username and password labels and fields. // Do some validation (disable when username is empty). // Request focus on the username field by default. There are several predefined dialogs and alerts: Information, Warning, Error, Confirmation, Text Input, and Choice. The predefined dialogs allow some level of customization of their content and buttons. 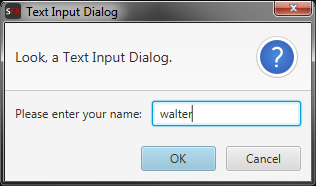 Source code for the examples of pre-defined dialog including customization are in DialogsDemo. A completely customized dialogs can be created using Dialog class. Source code for a custom dialog is in LoginDialogDemo.